If you’re on Facebook, please click the “Like” button above. Thanks! 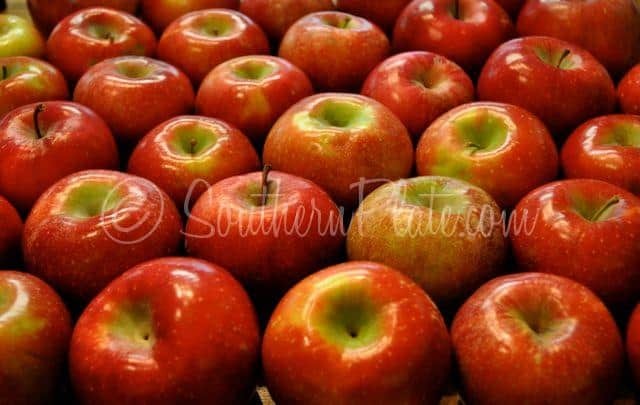 Today begins Apple Week on SouthernPlate.com! I have over THIRTY apple recipes to share with you this week so be sure and Subscribe by email so you don’t miss a single recipe! They all sat down to eat their meal but Grandmama said all she could think about was those apples and she sat there trying to eat and hoping so bad the lady had made some for them. When they finished eating the lady who owned the house came to the table with two big old pans of baked apples, one for everyone. So today I’m going to show you the simple way to make baked apples, and how to do it in your slow cooker (or crock pot, as most folks call it). This is a simple recipe, prepared like they did it in the old days where you just core your apple, stuff it with some good stuff, and bake away! But now the bonus is that you can do it in the morning and come home to that same smell my Grandmama walked into all those years ago. Now, I doubt I’ve ever made these the same way twice. It’s just one of those recipes you can throw together and customize to your liking or based on what you have on hand. Today, I’m keeping it simple but I’m going to give you lots ideas to personalize it and make it your own and I want to hear your ideas in the comments on this post, too! You can also add: Pecans, walnuts, oats, or anything else you come up with! 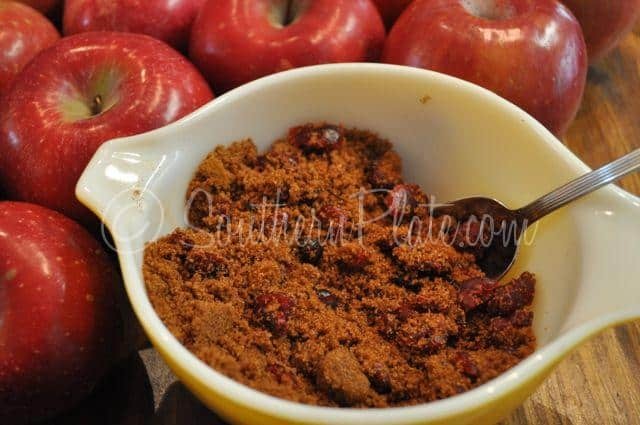 Place your brown sugar, cinnamon, and allspice (or whatever spices you are using) in a small bowl and stir them up really well. Add in your dried cranberries or raisins and stir those up as well. Usually when I cook with raisins or dried cranberries I like to soak them in really hot water for a few minutes to plump them up a bit before adding them to the recipe but these will be slow cooking with plenty of steam in there so there isn’t any need to do that here. I’m not a big fan of kitchen gadgets, mainly because I am unorganized and so I either lose them or can’t find a place to keep them, but I did break down and buy one of those apple corer thingiemabobbers. It is about the size of a vegetable peeler and it sure is neat! I like that thing. After you core your apples peel off just a little strip around the top. This is supposed to keep the apples from splitting as they cook but I mostly just do it because Mama told me to…. 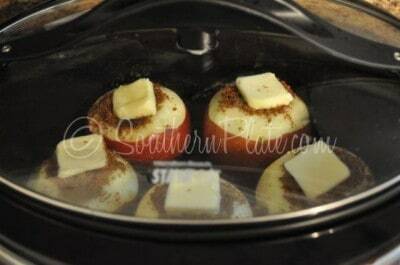 Now place them in the bottom of your slow cooker and use a spoon to fill each apple with your sugar mixture. Then, take your finger and push the filling down in there and fill it up some more! Top each one with a pat of butter. You can also cut the butter into your sugar mixture but this works just as well and is less work. You work hard enough as it is, it’s okay to take an easy pass. Cover with lid and cook on low 6-8 hours or on high 3-4, or until tender. My husband loves these served with a scoop of ice cream. Leftovers are great heated up the next day and served with oatmeal! Remember to add nuts, oats, spices you like, and anything else to really make this recipe your own! Oooh, how about serving it with ice cream and caramel sauce? Core each apple and peel a small strip from around the top of each one (about 1 inch). Place in bottom of slow cooker. Combine brown sugar, spices, and dried cranberries in a small bowl and stir until well combined. Stuff each apple with filling, all the way to the top, pressing down with your finger to make room for more filling. Top each one with a pat of butter. Pour water into bottom of slow cooker. Cover and cook on low 6-8 hours or high 3-4 hours, or until tender. Serve on their own or with ice cream. Also great over oatmeal. To bake in the oven : Follow the same recipe, but place in baking dish (8x8 or 9x13) and pour water in just as before. Bake at 350 for 30-45 minutes, or until tender. Submitted by Jenny (thanks, Jenny!). 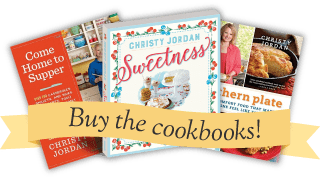 I’d love for you to submit your positive or uplifting quotes to use in future Southern Plate posts. To do so, please visit my Give A Penny page by clicking here. with at least three more apple recipes in it! I’ll post links on our Facebook page, too! Let me know how you like them Kristin! Oh I can’t wait for you to see the rest! I’m sooo excited about apple week! haha! This one sounds delish! Thank you so much Kirby! It’s always one of my favorite weeks, too! We went this past weekend, it’s so much fun! I always look forward to taking the kids each year. Hope y’all have a GREAT time (I know you will!)! Going down and getting out the crockpot, right now. This will be delicious with dinner or for dessert. And the house will smell Amazing!!! Can’t wait, thanks!! Love cooked apples. I do something similar, but I put red hot candies in the middle with brown sugar and cinnamon instead of the raisins/cranberries. 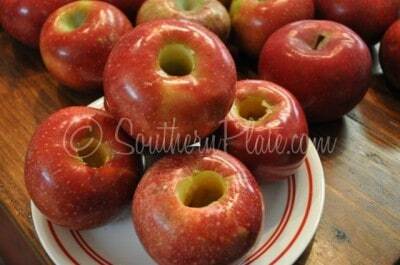 I haven’t cored apples before, if you use a corer, does it make a hole all the way through the bottom of the apple? These look great – but I have a really dumb question. 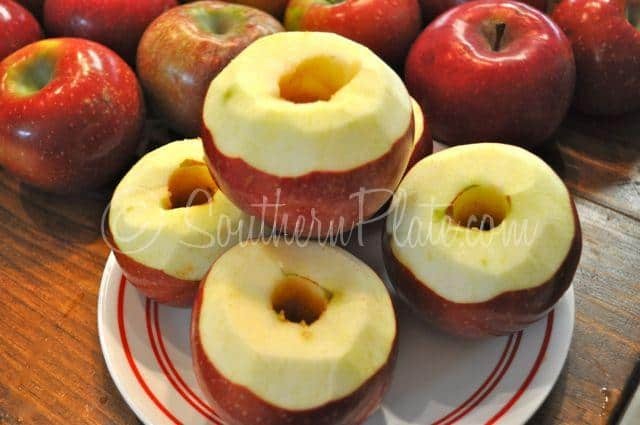 If you core the apples all the way through to the bottom, doesn’t all the yummy stuff you stuff in the middle just go right out the bottom of your apple while it’s cooking? Sure is Kelly! I just went back and added instructions on how to bake them in the oven to the recipe thanks to your wonderful input! Please look at the recipe again (it’s at the bottom) and holler if you have any questions. Have a great day! Those Do Look Delicious! 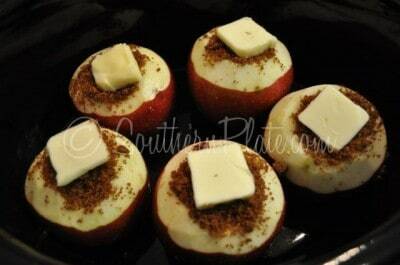 I was wanting something to do with apples. You read my mind! Thank You once again for another.. Great and Easy, recipe! 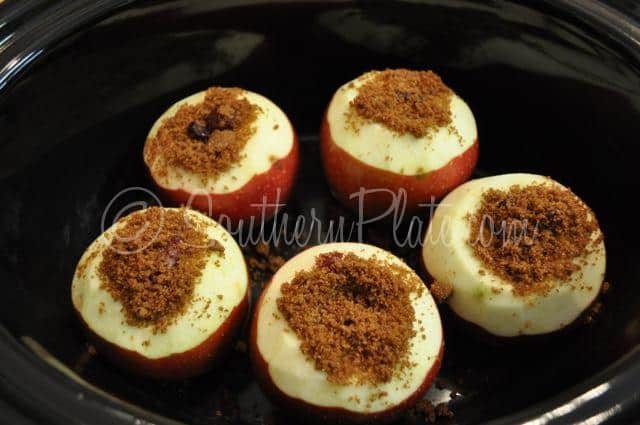 What is the best kind of apple to use for making baked apples? 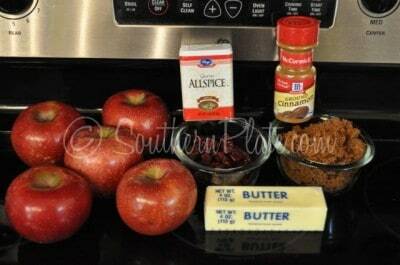 Oh I hope apple week includes a recipe for fried apples like the ones they have at Cracker Barrel! I’ll bet you (or your Grandmother!) makes something like them but better!! Gonna have to try these soon. Wish I had one NOW!! WOW! I can’t wait to try it. What kind of apple do you think would be best suited for this? I know some kinds tend to fall apart more than others. I, too, love cooking with apples. Just last week I baked an apple-cream cheese bundt cake. I will eagerly read all and try some of your apple goodies! What kind of apples do you think are the best to bake? I’ve used Granny Smith before just because I’m a Granny Smith apple fan. 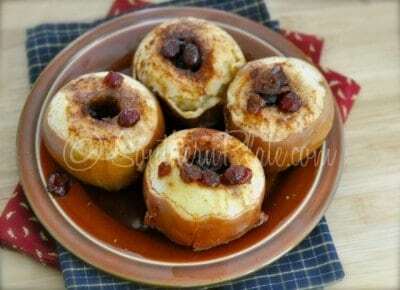 I’ve never made them before in the slow cooker but do plan on doing it tonight! Thanks bunches!! My grandmother made them with red hots in the middle….YUMMY!!!! They were one of my very favorite things she made!!!! oh my, its almost my lunch time and my mouth is sure watering…mmmmm I can’t wait to make this! My mouth is watering-love the old time comfort foods I grew up with. I can’t wait to try these! I hope your family loves apples! It sounds like they’ll have them coming out their ears with all those recipes! I made bite size Apple pies from Taste of Home’s recipe. So good!! One Apple wedge wrapped in a strip of pie crust that had been covered in melted butter, cinnamon, and sugar. They were the perfect size for a Wednesday night church snack. I’m looking forward to more Apple ideas! I was just talking with my cousin Saturday about baked apples and was wanting a recipie to try and here it is. I think I will try the recipe and use the red hot candies like a couple of others had mentioned. I had to smile when I read “Because we didn’t have no apple tree!” We get so caught up thinking of the way things are now, that we lose sight of how things used to be. Today we just go to the store whenever we want and get whatever we want. That was not the mindset back then. They went to the store rarely and got only the things they needed and couldn’t do without. Notice how much she genuinely appreciated something as simple but rare (to her, anyway) as a baked apple that most of us can go to our kitchens now and have by suppertime. Love your stories, Christy. I make this recipe almost exactly like you posted, but instead of water in the bottom of the pan I put apple juice. 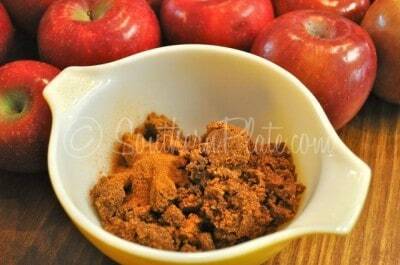 It give the apples even more flavor and makes the house smell even more wonderful. Thanks for all your recipes, stories and ways of looking at life. I look so foward to see what you have posted everyday! Love ya! I’m thinking peanut butter, cream cheese, brown sugar and spices would be yummy. I use a melon baller to remove the core but not cut thru the apple. This keeps all the good stuff inside the apple. There are soooo many possibilities! Thanks for the recipe! Can’t wait to try this. Is there a type of apple that bakes better than others? If you are starving or in a hurry – I have made baked apples in the microwave. (Start with 5 min and just keep checking until they start to cave in a little at the top.) Also, Mamma use to pour Kayro syrup in the middle along with butter if you have no brown sugar handy! Thanks for the tip Diane!! I am going to have to remember that!